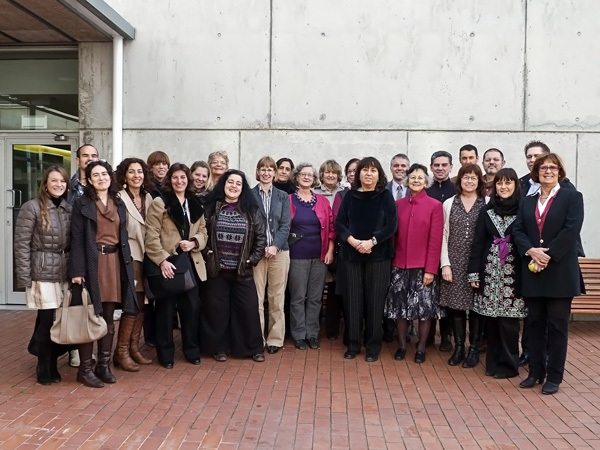 15-16/02/2012: kick-off meeting of the Thematic Network on Empirical and Experimental Research in Translation, organized by PACTE group. 10/09/2010: The PACTE Group was awarded the Universitat Autònoma de Barcelona Prize for Outstanding Research (Premi d’Excel•lència a la Recerca 2010 - UAB PREI2010 UAB) for the article “Results of the Validation of the PACTE Translation Competence Model: Acceptability and Decision Making” published in Across Languages and Cultures, Vol. 10 n. 2 (2009). Roundtable Discussion on Results of PACTE’s Experimental Research on Translation Competence, Vic, 1-2 October 2010. The PACTE group celebrates its 10th anniversary (2007). Fabio Alves and Amparo Hurtado, principal researchers of the project "Un enfoque cognitivo-discursivo en la formación de traductores: Una investigación empírico-experimental del producto y del proceso de la traducción con la aplicación de las nuevas tecnologías" (PHB2002-0010-PC), Programa Hispano-brasileño de Cooperación Interuniversitaria del Ministerio de Educación, Cultura y Deporte between the group Pos-Lin Net from the Universidade Minas Gerais and PACTE, 2002-2006.